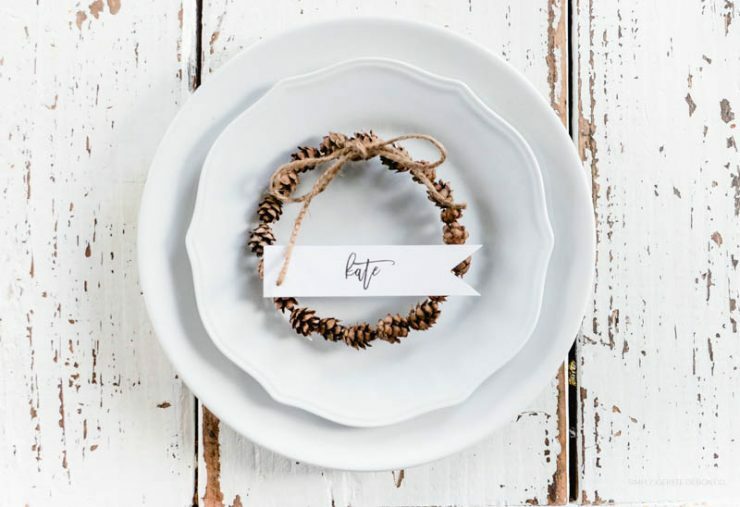 Mini Pinecone Wreaths | Holiday Table Ideas | Simply Kierste Design Co.
Mini Pinecone Wreaths are easy to make, and add the perfect touch to your Thanksgiving, Christmas, or holiday table. 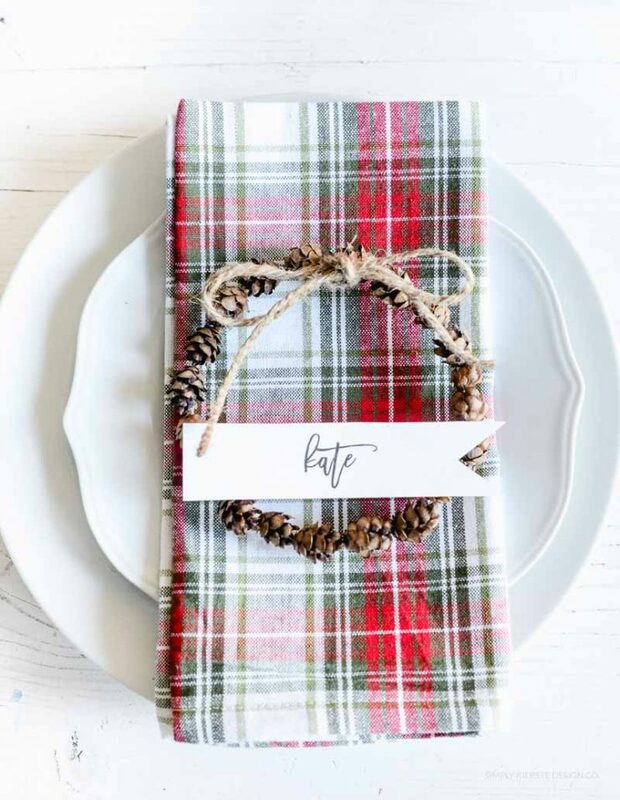 Hang them on the backs of your chairs, or use them as place cards! 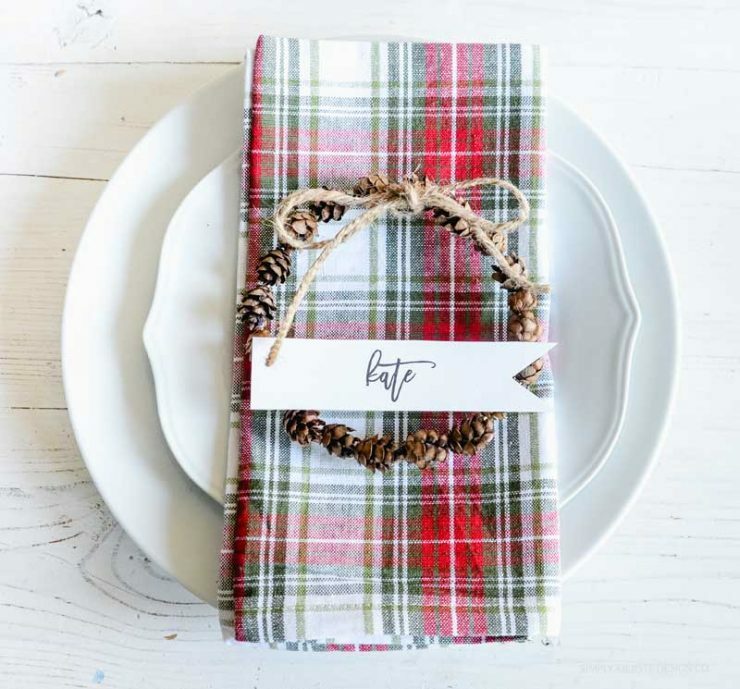 Dressing up my table for family and friends to gather is a special way to greet them, and let them know how excited I am to welcome them into my home. I love simple touches best — ones that will make my table beautiful, but also save on time. 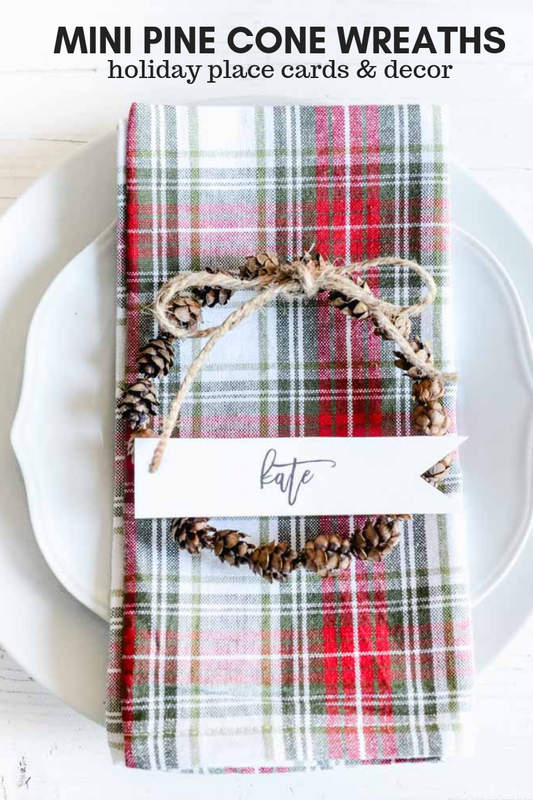 Mini Pinecone Wreaths Place Cards — Perfect for the holidays! For the holidays this year, I decided to make Mini Pine Cone Wreaths. I’m going to use them in a couple of different ways, for both Thanksgiving and Christmas. 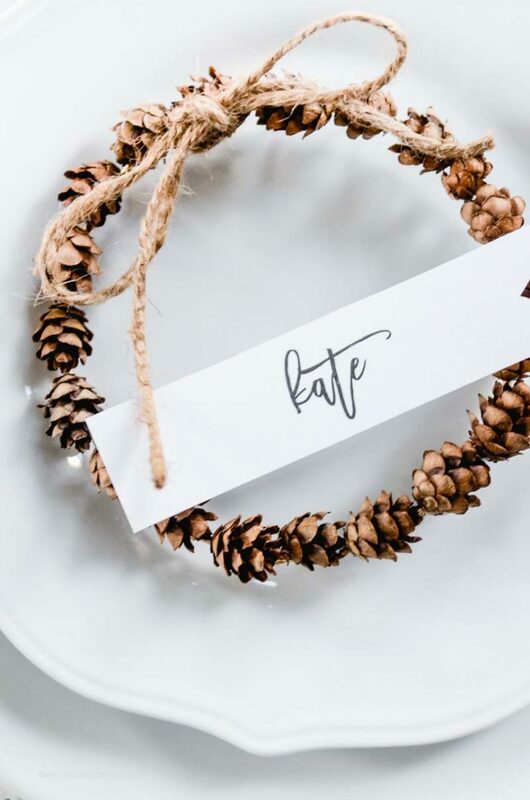 When you add a names to the wreaths, they become that most darling pine cone wreath place cards. I’m also planning to hang them on the backs of my chairs for added fall decor, when they’re not in use on the table. Affiliate links are included below for your convenience. If you click on a link and make a purchase, I receive a small commission at no extra cost to you. 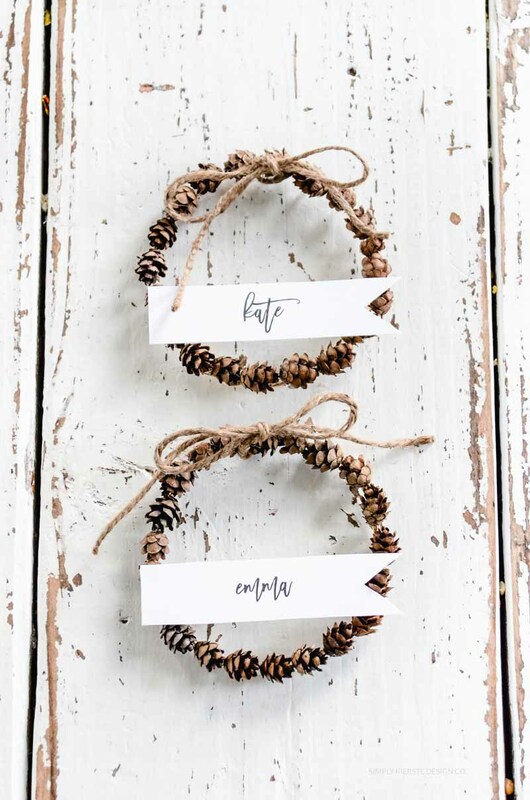 You just need a few supplies to make these mini pine cone wreaths, and they go together pretty quickly, especially if you invest in a helper or two! I used the really mini pine cone wreaths — 1/2 inch to 1 inch — but you can also use slightly larger pine cones (2 inches). You’ll fit fewer around the wreath, giving it a slightly different look, depending on what you like. I used 12 gauge floral wire to create the wire frame for the wreath. If your pine cones are a little bigger or smaller, you can easily adapt the wire frame to be the size you need. Decide how big you want your wreaths to be (mine are around 6 inches in circumference). Using your wire cutters, snip off a piece of wire to make that size wreath, plus a couple of inches extra. Create a circle with your wire (I used a large glass measuring bowl to get a really round shape), then use the extra wire to wrap around the wire circle to secure it. 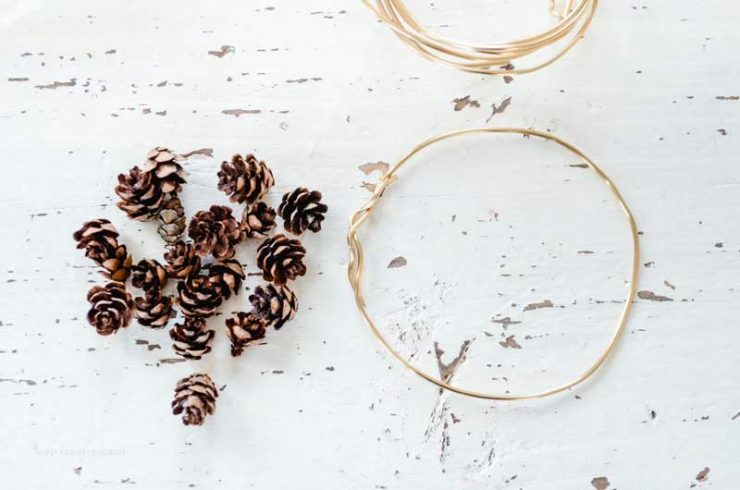 Place a small amount of hot glue on each pine cone, and place it directly on top of the wire wreath. Repeat with each pine cone, making sure to place them in the same direction, and as close to each other as possible. Jute was used to tie a bow around the top of the wreath, for an extra little touch! I also printed out names on to white cardstock (font = Scriptina), and cut a little “v” on to one end to fancy it up a little. When the holidays are over, you can carefully pack them away and use them again and again! CLICK HERE TO SIGN UP FOR MY NEWSLETTER! DON’T MISS A THING! I found them at my local grocery store…Wegman’s! !